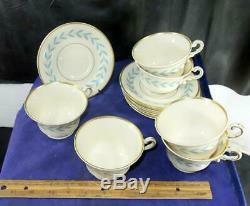 Vintage Set Of 6 Sherwood Old Ivory Syracuse China Tea Cups w/ Saucers! Item : We have a lovely vintage set of 6 Sherwood Tea Cups with Saucers! 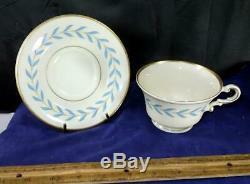 The cups and saucers are by Syracuse China. The set has a gold trim with a band of blue laurels. Terrific additions to your other Syracuse China. Please check our other auctions for more vintage items including more Syracuse China (and more of this pattern)! More neat stuff at our store! Size and Makeup : The cups are 2 3/8" tall, and 3 7/8" in the top's diameter. Saucers: 5 5/8 in diameter. Condition : All pieces look great! We see no usage marks on saucers. Good color and gold trim! Saucers: Old Ivory Syracuse China O. 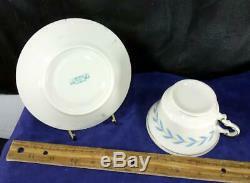 EXCELLENT pieces for the Syracuse china collector! GREAT pieces to display or add to the collection. We usually have other exciting pieces of Syracuse China listed. Please check our other auctions and store! Package weight is about 7 pounds. This price is for the continental US. We reserve the right to adjust the carrier if we feel it is warranted (safety, tracking, etc), at no extra cost to you. First class is mailed in a pouch. If it is only a couple dollars we will cover it. First, we would like to thank all our past and future buyers! Your business is very important to us! All items that we sell, including antiques and collectibles (new and old), are intended for the adult consumer. We have done our best to accurately describe the item listed above! We are in no means an expert on the above listed item. But, occasionally we do miss something. Any provided (factual, with proof) information would be greatly appreciated and generalized statements will be ignored! We consider the detailed photos we provide as part of the description. WE DO NOT END AUCTIONS EARLY unless we have inaccurately described an item and can not change the description to meet our standards. We do not sell on approval. We will try and do our best to make your shopping experience a pleasurable one! What "as is" means: This only applies for listings we have stated to be as is. " First read the "Condition above for our brief visual description. The piece you are purchasing may or may not work. But, if we stated above that the item works then we stand behind this. It may be missing parts or components. Parts that are included may or may not be correct or original. There may be damage that we missed or did not photograph, but we do our very best to avoid this. We are not experts on the piece you will be receiving. Your experience should allow you to know about potential problems we are unaware of. If you need additional photos we would be happy to take more. If you have read this far, thank you! Feedback is very important to us! Otherwise we will be unable to help you. Feedback is left after we receive it from you. Get images that make Supersized seem small. Tailor your auctions with Auctiva's. Attention Sellers - Get Templates Image Hosting, Scheduling at Auctiva. The item "Vintage Set Of 6 Sherwood Old Ivory Syracuse China Tea Cups with Saucers" is in sale since Wednesday, March 27, 2019. This item is in the category "Pottery & Glass\Pottery & China\China & Dinnerware\Syracuse China". The seller is "taylorrae" and is located in Syracuse, New York. This item can be shipped worldwide.